Our airframe is the Skywalker X8: a flying wing design with approx 2m wingspan, 800g frame only, ∼5kg maximum take-off weight, and EPO foam construction with carbonfibre rods to stiffen wings and plywood wing and motor mounts. We picked the X8 for its relatively large payload capacity, expected ability to cope with high winds (ideally 50km/h for the OBC), and its low price; we plan to destroy a few airframes during development. The flying wing approach is also nice from the perspective of our intended control approach (NMPC), since the computational load varies with the number of control outputs. In the case of the X8, we only have to worry about the the two elevons and the throttle. Most people seem to be using 11–14″ props and 4S ∼800KV motors. Several have reported flight times well over an hour when using multiple 10Ah batteries, so endurance should not be a problem assuming we can get the right combination of prop and motor. While planning the build, our objective was to make as few modifications to the stock airframe as possible, since we’re treating them as disposable. Obviously there’s no point getting a cheap airframe if each one requires hours of modifications to be useable. We stuck everything together with foam-safe CA for foam/foam joins, and two-part epoxy for the foam-plywood and foam-carbonfibre joins. There seems to be some debate online over whether it’s best to use foam-safe or non-foam-safe CA (and then whether or not kicker should be used), but nothing major has broken yet so our approach seems good enough. Servos were mounted at the top of the wings (cutouts are at the bottom, but that seems like a very bad idea). Slits were cut in the top surface and control horns attached; the servos were glued in from the bottom and then the gaps were covered with fibreglass tape. The servos used were Hitec 225MGs, which are small, sufficiently powerful, and very cheap (just as well since they're stuck in the wings now). 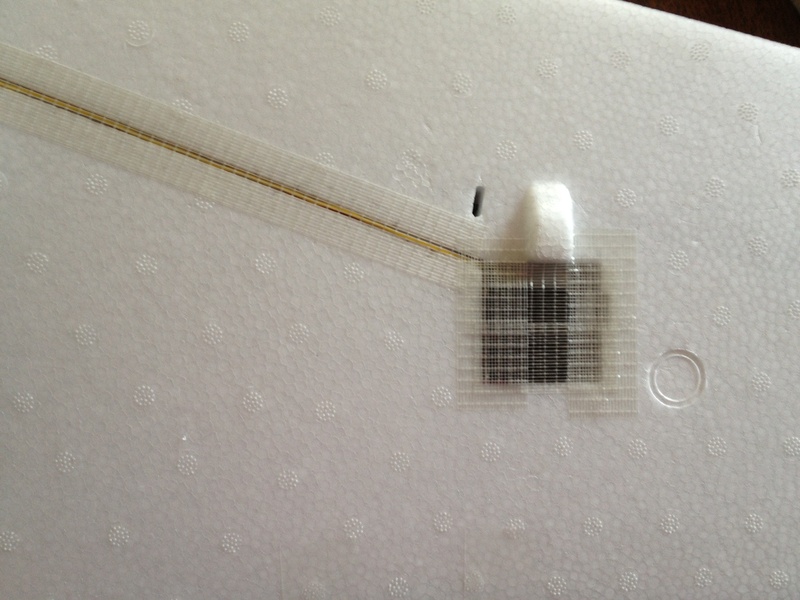 All seams (there were a few big ones, QC doesn’t appear to be especially good) were covered with fibreglass tape. After wings are attached prior to flight (wire through the holes in the plywood mounts), we also cover the wing seam with fibreglass tape, and add a couple of lateral strips across the top and bottom of the fuselage reaching the wings—during some of the early flights the wings started to detach. Fibreglass tape hinges seem good for elevon attachment; initially we used 3M Blenderm tape but that stretches too much in flight. 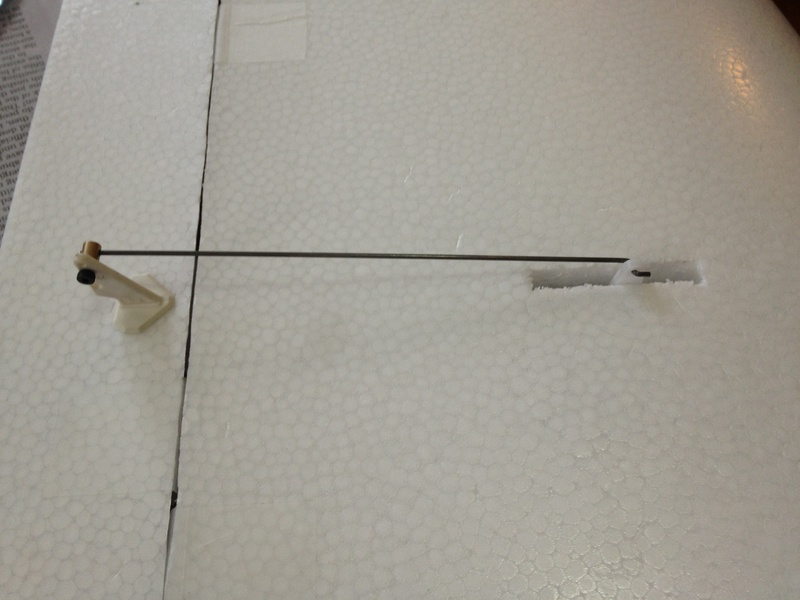 Fibreglass tape is OK for elevon attachment, 3M Blenderm is really not. Stock elevons are very flexible. Some people suggest replacing with balsa, but too much effort. After the first couple of flights, we covered them in carbonfibre cloth and epoxy, with a 1.5mm carbonfibre rod along the trailing edge. This makes them much stiffer and dramatically improves roll response. Very sensitive to CoG. Should be in the middle of the forward finger cut-outs; further back means it’s very hard to control, and further forward means you can’t pitch up. Fuselage is surprisingly robust. We’ve crashed it into a tree, nose-dived a few times, and there’s been no real damage to anything but a prop (broken), the pitots (epoxy detached) and the motor mount. The stock motor mount is not much good—we’re now using an aluminium plate on the inside of the fuselage, and bolts going all the way through to the plywood mount on the outside. This is much more secure, and seems to help a bit with vibration. There’s not much airflow at the back where we’ve placed the ESC; this is an open problem but we’ll probably just put a scoop/vent in the top cover. 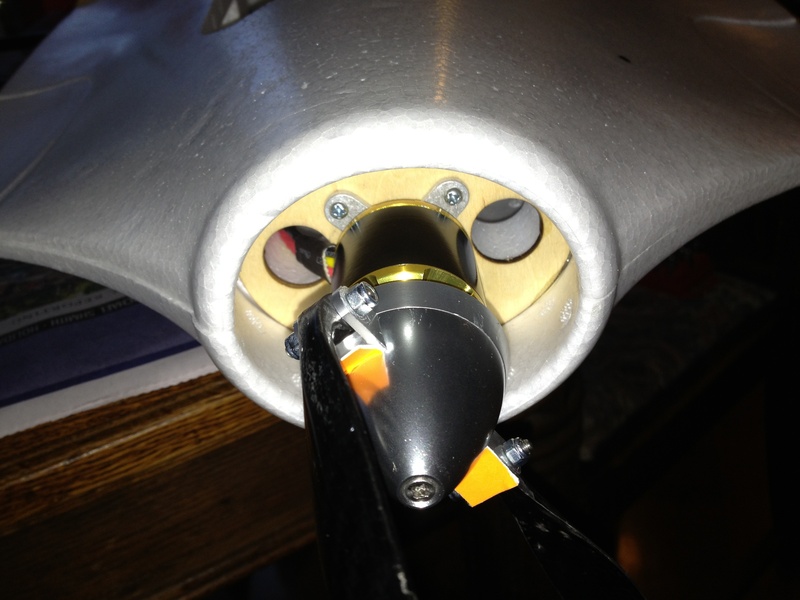 Use a credit card or similar to prevent the folding prop blades from folding back over the axle—i.e. such that both blades are on one side. This causes massive vibration and will destroy your motor mount very quickly. Hand launch is really not too bad, just throttle up until it feels easy to throw, and follow through to get your hand out of the way quickly (but wear a thick glove just in case). Landings require a lot of space, as the airframe glides very well in ground effect. However, hard landings (e.g. ∼20° downwards angle) don’t seem to cause any real damage, so that’s always an option. The X8 copes reasonably well with wind—we’ve tested at 40km/h with gusts up to 60km/h—but pitch stability is not great. There’s probably not much that can be done about that as it seems inherent to the design. Trim seems to be a bit of an issue—we don’t seem to be flying straight. CoG placement may need to be further back for efficiency. ESC/motor/prop combination needs some work; we’re using a 4S 1190KV motor and a 13×5 prop with a 110A ESC, which generates 40–50N thrust and has a top speed of about 130km/h, but it’s much more powerful and much less efficient than we need. Payload placement is going to be critical since the release must avoid shifting the CoG by more than a centimetre or two. The wings flap around a bit at higher speeds, which looks worrying. We’re planning to cover the underside of the wings and fuselage with woven carbonfibre and epoxy, which will hopefully improve stiffness and damage resistance a bit; other options include adding carbonfibre rods through the fuselage and wing roots, or within the wings themselves.